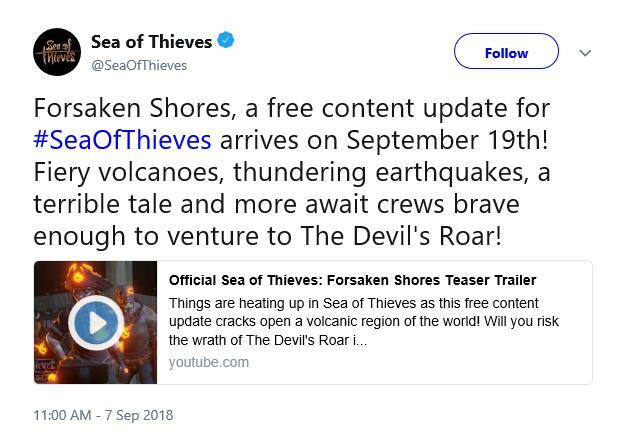 Despite having to do a hotfix yesterday to correct some recent issues added via a previous Sea of Thieves update, Rare is sailing ahead with the Forsaken Shores update on 09/19/18. The free update will be making the environment a bit more....turbulent? It introduces The Devil's Roar, along with Volcanoes, earthquakes and more. Watch the teaser trailer for a taste of what is coming, with servers live on Wednesday 09/19/18 at 9am EST.